Northern Minnesota Fishing Reports Archive Section. July thru September 2005. Amidst the turbulent weather and cooling water temperatures, the big fish in the Itasca Area are on the prowl. Thanks to some rainy days and cool nights water temperatures are dipping in to the lower sixty-degree range. 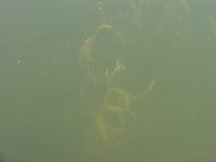 Some weeds are beginning to die off and there are noticeable movements of bait and fish out to the deeper shoreline breaks and points. Large Walleyes like these don't come along every five minutes. But if you're up for the search and have a bit of patience, you can catch one. Smaller Walleyes and Pike keep you busy during the search. Thanks to a special project we’ve been working on, I’ve had a chance to fish several area lakes in search of larger fish and it has been a ball. Walleyes and Pike have been using the deeper portions of the best shoreline structures. These are structures like points or deep inside turns that have all of the cover a big fish would need. Before you start fishing, locate areas that combine shallow weedy flats, immediate access to deeper water (thirty to seventy feet or deeper), rocks & clam beds. Once I have a few spots in mind, I watch my graph for fish on the edges of the deeper breakline. Key depths for me have been 24 to 36 feet of water. You will discover fish deeper too, but for us the largest fish are hugging that initial deep breakline. Another nice example of rigging up a Large Walleye. This one was laying on the edge of some deep rocks in about thirty feet of water and fell for a rigged Creek Chubb. Photography by Twin Cities legend, Peter Raquet. Walleyes have responded well to large size Creek Chubb and Redtails (when I could get them) fished on a Lindy rig with a ¾ ounce sinker and five-foot leader. 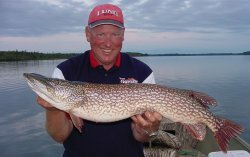 To give us an extra measure of safety in landing the large pike, I tied the leaders with 1/0 hooks and 20 pound fluorocarbon line that has a durable, clear finish. Thanks to these leaders, we’ve only lost one pike due to a bite off in the past week. I’d really recommend looking in to this stuff. Some of the better Walleyes have also responded well to night crawlers fished on a more conventional rig and as a back plan, the crawlers would be an excellent second choice. We used a size 4 hook and tied the leader using six-pound Berkley Iron Silk line. This is also a good, durable line for tying the lighter leaders. If you want to get into this subject in more depth, click here to read an article on the subject. Meanwhile, the Walleyes of eating and action size are gathering in larger schools in the shallow water weed beds making the fishing really fun for lots of folks. Weeds found in water depths of 6 to 12 feet are holding lots of baitfish and the Walleyes are in there feeding heavily for the winter. This low sixty-degree water is perfect for this action bite and we should have fairly reliable fishing for the next week to ten days and if the weather holds, maybe even longer. 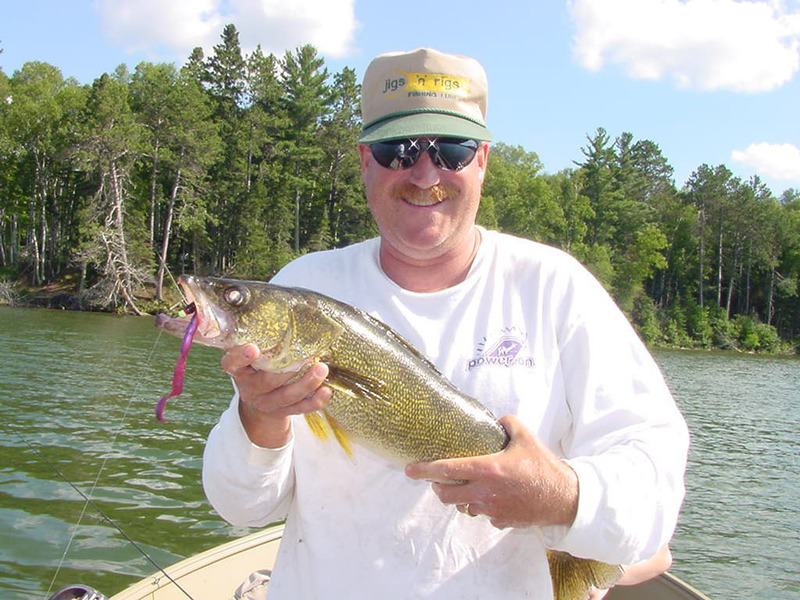 Folks using every kind of bait from soup to nuts are capturing walleyes. Leeches, Crawlers and jig & minnow combos are all producing fish and for the time being it’s "anglers choice" fishing. However, the jig and minnow bite is getting more reliable by the day and this will continue to improve as the waters cool down. My personal advice would be jig & minnow on breezy days and night crawlers on calm days. Even though the action has been best around the weeds, I’d check the rocks too especially on windy days. Crappies are moving out into some of the more open terrain and can be found in small packs. It’s been a little unpredictable and sometimes the bite has been sluggish requiring lots of attention to trigger a bite from the fish. More and more now I’ve been waiting for the last couple of hours of daylight before going after them and it seems to help. The method for catching them is largely the same as it’s been during past reports except that we are now searching a little further out from the breaklines and open water, soft bottom areas are becoming more important to us. Look for any sign of a roaming pack of fish, hover over the school and fish vertically with a jig & minnow. These fish have been particularly interested in a slow presentation and at times we’ve had to stop moving the bait completely before they would bite. Nice size bluegills are starting to roam the deep water just like the Crappies. A good way to fish these areas are to set up one angler with a worm and another with a minnow. Once you see what kind of fish comes up you can switch baits accordingly. Bluegills are also locating further out into open water and finding them is a lot like finding the Crappies. In fact, we’ve found some of the schools mixed with Crappies. A smaller jig tipped with a piece of cut night crawler or a tiny leech has worked fairly well for the ‘gills. 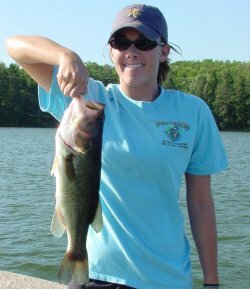 Largemouth Bass are still scattered, but mainly located on the deep edges of healthy green weedbeds. The better fishing is still found by using soft plastics and casting to the deep weed edges. But, the spinnerbait bite is coming on as well and it won’t be too long before the fish concentrate on deep bulrush edges adjacent to good stands of Cabbage or Coontail weeds. Smallmouth Bass are still located on deep structure like sunken islands or deep underwater points with rocky cover. Fishing the edges with rigs and minnows has been working well. A four to six inch minnow like a golden shiner, large rainbow or even a smaller creek chubb will work well. Musky and Pike anglers are back in business again this week with good fish movement in the shallows where good schools of Perch and Walleyes are beginning to gather. Top water baits, crankbaits and wood are turning them on right now and there’s been a pretty nice sampling of larger Pike mixed in with them. As Tulibees and or whitefish begin staging in their fall spawning areas, look for the Musky/Pike action to build over the next few weeks. September takes forever to arrive and it feels like it’s over in about a half-hour. Get out here now and enjoy it while you can. Fish in the Grand Rapids and Deer River area are responding to the falling water temperatures and the early fall bite is getting more reliable each day. One caveat is that the fish aren’t completely moved into their fall locations, so you’ll have to do some looking to find the areas that attract the earliest groups of fish. Pike are hungry! This medium size Pike inhaled this big Salmo Warrior. Lots of Pike action as they put on the feed bag for fall. 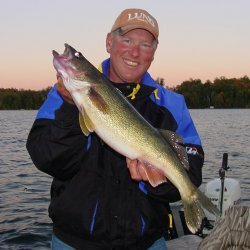 With the water temperatures remaining in the mid sixty degree range, Walleye anglers can still locate some fish on the deeper main lake bars and points, where we continue to use Leeches fished on a live bait rig with about a five foot leader. The deep breaklines that are adjacent to large flats that meander toward the shoreline are especially good because these flats are key transition routes as the fish make their way to the main shoreline breaks where baitfish will be gathered. During the transition, fish will stop and feed near small rock piles or near deeper isolated weedbeds. The fish that use these areas will be transient, so if you want to fish the flats, be prepared to cover lots of water and keep a constant eye on your electronics to reveal new spots to fish. Spinners and bottom bouncers, trolling crankbaits or even jigging at a fast pace will put some fish in the boat. 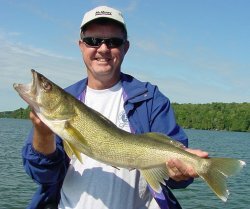 Walleyes that we’ve located in the shallower water have been responding better to jig and minnow fishing and now that these fish are arriving in decent numbers, we’re putting more emphasis on this approach. The action is generally faster and the likelihood of a mixed bag appeals to lots of my customers. Shallow water fish are generally relating directly to the weeds except when there is enough wind to stir up some action on and around rocks or mixed rock and weeds. For the time being, if the water is calm, skip the rocks and search in the weeds. If you like to fish live bait rigs instead of jigs, try using a light bullet sinker, a three to four foot leader and a crawler in these shallow weeds. Northern Pike action has continued to improve and we’ve found that many of the Pike we’ve kept have been feeding on Tulibees. The Tulibees are located in areas where the larger flats containing mixed rock and gravel. Concentrating on the weedbeds adjacent to these flats has been good for us. 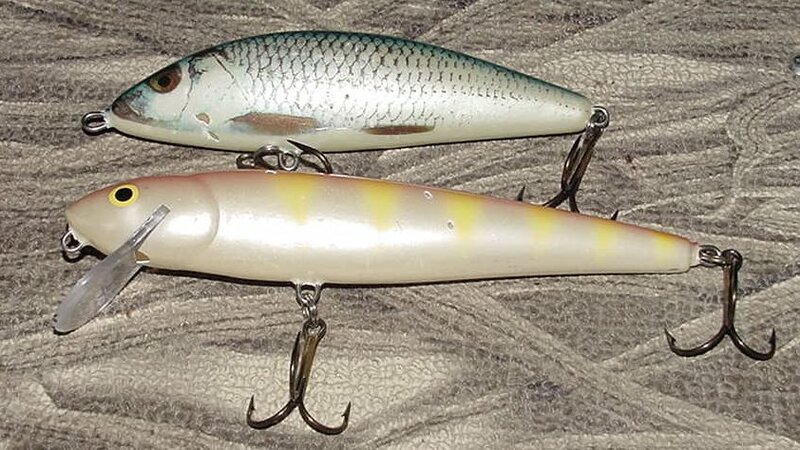 The best bait selection for casting has been the large minnow type baits that I mentioned in last week’s report. The Salmo baits, especially the number 18 Whitefish have been consistently producing the best number of fish. We are also catching some pike on the Suick and a few on the larger Bucktail baits. Rattle baits that produced so well a couple of weeks ago, have slipped off the charts and while we continue to experiment with them, they’ve been poor producers this week. Crappies have taken over the lead position in Panfishing right now and with many schools of fish forming in the deeper water, this has been a reliable way to add some action to the day. We are now bringing some crappies in every day. There’s only one key to finding and catching these fish, slowly follow the deeper drop off searching for schools of fish suspending in water from 18 to 26 feet deep. Once a school of fish is located, hold the boat stationary above the school and drop your jig/minnow slowly into the school of Crappie. These fish like to be teased and a bait that falls slowly (or is lowered slowly by the angler) will produce a lot of bites before your jig can reach the bottom. If it does reach bottom without attracting a bite, slowly raise it back up again about a foot or so at a time. Repeat this process as needed until you uncover the trick of the day for getting them to snap up the bait. Crappies will suspend fairly high above the bottom so really effective Crappie anglers are continually probing up and down like this to locate the level that fish prefer on a given day. Don’t be surprised by fish that come up to within a few feet of the surface, these fish are active and will bite readily if you remember to bring your bait up high enough to catch them. Bluegill anglers continue to find some fish along the deeper weed edges and deep drop off areas close to these weedy flats. We’ve caught them by fishing near the bottom with a small jig, ice fly or hook/splitshot. Waxworms, tiny leeches and cut pieces of night crawler are all about equal. The Bluegills seem to require less movement right now and a bat fished almost motionless a few inches above the bottom has worked fairly well. It’s been a busy week and I have to cut the report a bit short today, I have additional information about Bass and Musky fishing that I will update tomorrow. Check back if that’s your cup of tea. Fishing Report 8-31-05 Walleyes and Pike On The Move! Another week of cool weather has continued to whittle away at surface temperatures bringing them down another degree or two on most lakes. Mid sixty degree water continues to encourage fish to move toward fall locations. There’s both good and bad news for Walleye anglers as the transition occurs. It’s great that the fish are feeding and biting aggressively. It’s not so great that they keep moving every day and that you have to begin your search anew each time you head to the lake. For really versatile anglers, there have been enough fish to keep it interesting and there are even some banner days when hitting a large, active school produces fast action. These are larger groups of fish moving (slowly) along the deeper main lake bars toward shallower flats adjacent to the shoreline. These large, mid depth flats in 10 to 16 feet of water are holding good numbers of fish. The problem is that fish are spread out over a large area and can be tough to pin down. In deep water, especially on the main breaklines, we continue to use Leeches fished on a live bait rig with about a five foot leader. While we’ve had the best action with them out deep, there are a variety of other baits all working equally well in the shallow water. Crawlers and minnows are becoming the preferred weedline baits and there are some fish being caught trolling crankbaits on the outer edges of the weedline. Jig and minnow fishing can produce the best overall action right now and will likely yield a variety of species. The Salmo Sinking Warrior (top) and the Salmo Whitefish (bottom) have both been excellent producers for nice Pike this week. Fish the Warrior like any other jerk bait, The Whitefish is a straightforward crankbait that we cast and retireve quickly. Northern Pike action is really heating up! Fish are gathering in larger numbers along the shoreline in weed beds as baitfish continue to stack up. We’ve been able to locate some good size fish by and some fairly good numbers by casting large Musky/Pike size baits. This is the preferred method for me because it generally produces fish of larger average size. Some really shining stars during the past couple of days have been large minnow type baits that remind these Pike of Tulibees or possibly even Walleyes in these shallow weedbeds. Two baits have been especially good, the Warrior produced by Salmo is a sinking bait that should be fished just like you’d fish other jerk baits except this one can be fished at any depth you choose and it has really produced well this week. The Whitefish (Shallow Runner) is a straightforward crankbait that has been best when cast and retrieved straight back to the boat rather quickly. Pike have been tearing this bait up. Other baits worth mentioning are the large size rattletraps, which have produced very well also. Bluegill anglers continue to do well, although the average size seems to have slipped a bit during the past week. We’ve found that while most of the bluegills continue to be located in the weeds and on the weed edges, there are some fish moving out deeper to the main drop off as well. We’ve caught some of these deeper fish while searching for Crappies and the only difference between catching Crappie and Bluegill has been switching between minnows and cut pieces of worm. Incidentally, I’ve caught an awful lot of Crappies on the cut worms and it may be worth having at least one person in the fishing boat stick with this method just in case you can get the double whammy going. A simple 1/16 or 1/8 ounce jig head in dark green, black or brown has been great for the gills. Most any of these compact size jigs will get the Bluegills going. We use cut pieces of worm, but waxies or other small grubs work well too. Crappies are getting more reliable as an option right now. There are more and larger schools of fish hugging the first drop off into deep water. Try following the edges at roughly 18 to 24 feet and watch your electronics closely for any signs of baitfish, schools of Crappie or even isolated deep weeds or brush. The fish are a little stubborn, but once you get the first fish or two, the rest of the school will perk up and give you an action spurt. 1-16 to 1-8 ounce jigs tipped with a minnow and fished vertically will get you some fish right now. Bass fishing continues to provide consistent action and while my favorite method, plastic worms on the deep weedline will still provide plenty of strikes, the spinnerbaits and crankbaits are picking as well. If you like casting, the next few weeks will be prime time for the early fall spinnerbait bite as fish are feeding actively for fall. We especially like to fish the bulrushes in areas immediately adjacent to deeper water. Cast your spinnerbait into the pockets between heavier patches of bulrushes and retrieve steadily toward the deeper breaks. Smallmouth are on the deepest parts of shoreline points, rocky bars and along the clean lip area outside of some deeper weed beds. They’ve been catchable on artificial baits, but they’re after meat right now and fishing with a live bait rig tipped with medium sized minnows is the best. Fish them like you would fish Walleyes except don’t feed line to the fish when they pick up the bait. Just let them snuggle up a bit and gently set the hook. Over feeding these fish can result in damage to the fish making releasing them difficult or impossible. - Good luck this week, check back for updates. Fishing Report 8-24-05 Fish in transition to fall locations, variety bite improving daily. After a cool week, Surface temperatures are falling into the upper sixty degree range with readings on some lakes creeping back into the seventies during afternoon sunshine. Fish movements are evident and lots of folks are finding that their favorite summer fishing spots are gradually becoming less populated as the fish move into staging areas on their way toward the shallows and other preferred fall locations. Walleye fishing has been good for versatile anglers who have spent some time searching for the better schools of fish and located new habitat. The mid summer patterns of following main lake fish that focused on insect hatches has given way to schools of fish that are in search of swarms of young of the year Perch and other types of minnows. These fish are feeding heavily on the minnows right now and once again the old adage "find the bait, find the fish" is coming into play. Weedline fishing has really improved with many of the schools of fish located just outside the weed edges on the cleaner drop off edges. Shoreline points and main lake bars adjacent to shoreline structure are key areas right now. Live bait rigging with Leeches has been my personal favorite for the past week, but we have caught several fish on night crawlers and even a few on jig & minnow. I’ve noticed that there are different preferences on different lakes and while the crawlers might be great on one lake, the fish in the next lake down the road may be biting better on the leeches. While I’ve been carrying minnows each day (mainly as a backup), we have yet to see the preference really switch over to minnows on any lake in the area. Bass fishing has been amazing! These critters are going very well on almost every lake I’ve tried and we’ve stumbled in to some fantastic action by fishing with jig and soft plastics. While the Bass have been aggressive, they have remained on the deeper weed edges and going deep with a 1/8-ounce jig head and plastic worm, crawdad or lizard has been the clear preference of these fish. We’ve had our best action on steeper drop off areas adjacent to weed flats or steep drop off areas adjacent to Lilly Pads. With all of the sun we’ve had lately, the Bass seem to really like that overhead cover as long as it’s near deeper water. We have not done really well in the heavy pads in shallower water, although there have been some fish in these areas. A Slug-go or similar type jerk worm rigged weedless is the ticket for these shallower fish. Bluegills are the name of the game in the world of panfishing right now. They have been biting aggressively on the deeper portions of the weed flats and out toward the weed points along shore. We’ve located many schools of Bluegills by fishing for the Bass with soft plastic baits and as we locate a school of Bluegills, we’ll take a few minutes to sample some fish by switching over to a small jig tipped with a wax worm, twister tail or half a crawler. If the fish are decent size, we’ll stop and fish them for a while. We've noticed that the smaller and more aggressive fish are quick to move toward the bait and will come quickly toward the surface to bite. We have to avoid temptation to cater to these aggressive biters and get the jig quickly to the bottom where there seems to be a better chance of catching nicer size fish. If necessary, switch to a 1/8 ounce jig with a smaller than average hook and fish it motionless near the bottom. You'll get less fish, better quality. Muskies did what they always do! The recent full moon and related stormy weather was just what the doctor ordered for anglers in the area. There was a two or three day period of good action for the big critters. Action was better on crankbaits like the giant size Rattle Traps and Salmos. The sunny weather hasn’t been good news for those of us who want to stretch the bite out for a while, but there are fish in the better weed beds right now and I’d recommend casting every time the weather gets favorable. Smallmouth are on the deepest parts of shoreline points, rocky bars and along the clean lip area outside of some deeper weed beds. They’ve been catchable on artificial baits, but they’re after meat right now and fishing with a live bait rig tipped with medium sized minnows is the best. Fish them like you would fish Walleyes except don’t feed line to the fish when they pick up the bait. Just let them snuggle up a bit and gently set the hook. Over feeding these fish can result in damage to the fish making releasing them difficult or impossible. Northern Pike are gathering in larger numbers in the shoreline weed beds and we’ve been able to locate some good fish by using a jig and minnow as a search lure. Once you’ve located an area where Pike are present, you can change your approach to casting in the area. It seems that casting will get some of the larger fish that prefer more size to the baits you’re using. Move frequently from weedbed to weedbed because some are occupied while others are empty. If you move enough, you’ll locate some active fish. 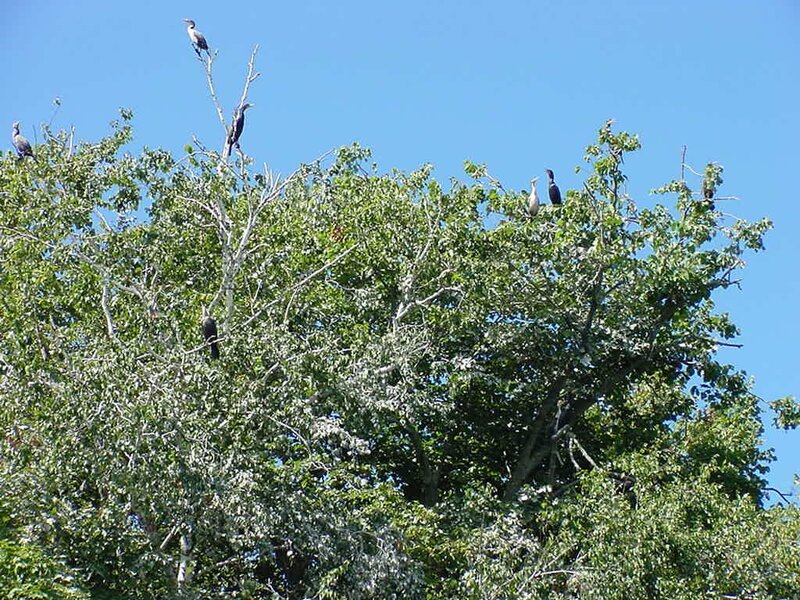 Cormorants appear to be taking up permanent residence in Cutfoot Sioux Lake this summer. There have been birds in the past, but they've never looked more at home than they do now. For those of you who have been following the stories about the status of the overpopulation of Cormorants in the area, I’d like to alert you to a fairly new development. A thousand or so (maybe more) Cormorants appear to be taking up permanent residence in Cutfoot Sioux Lake. 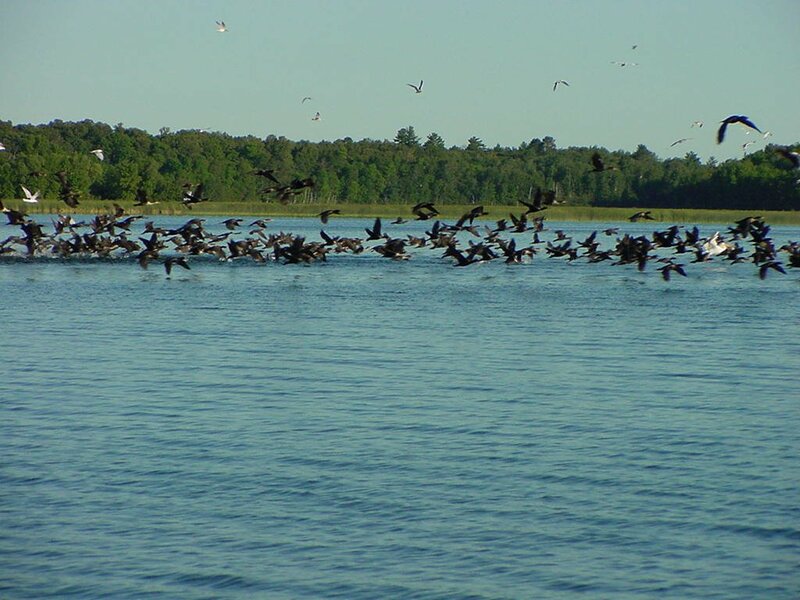 We’ve been seeing some flocks of birds in the Winnibigosh and Cutfoot areas for years, but these are birds not simply passing through the area, but living here and feeding daily on fish from one of the most popular and highly prized fisheries in the state. It would be a shame to see the balance between these hungry birds and the fish go out of whack as it did on Leech Lake causing or contributing to the crash of the Walleye fishery on that great lake. I’d sure appreciate you taking the time to look into this issue a bit more and contact the DNR Fisheries Manager Chris Kavanaugh in Grand Rapids to discuss the potential threat to the area fisheries and related tourism businesses. The phone the regional office, call 218-327-4430 or go ahead and use this handy link to contact him by email chris.kavanaugh@dnr.state.mn.us. It takes time for the DNR to respond to concerns, but in my experience, they will do so if we stay in touch with them. I’d encourage you to have a chat, just to get brought up to speed on sport fishing related issues. You will always learn something. Here it is. The full moon of August arrives along with the earliest signs of fall. Cool nights, warm days and gradually falling water temperatures. The warmest water temperatures of the season are behind us now as surface temperatures on most of the Grand Rapids area lakes have fallen below 70 degrees. Loons are gathering in larger flocks in preparation for their fall flight south and the falling temperatures are influencing fish and fish movements. From past experience, we should notice an increase in shallow water fish movements for the rest of this week followed by another lull in the action before the true fall fishing season begins. Walleye fishing has been good for versatile anglers who have spent some time searching for the better schools of fish and located new habitat. The mid summer patterns of following main lake fish that focused on insect hatches has given way to schools of fish that are in search of swarms of young of the year Perch and other types of minnows. These fish are feeding heavily on the minnows right now and once again the old adage “find the bait, find the fish” is coming into play. Weedline fishing has really improved with many of the schools of fish located just outside the weed edges on the cleaner drop off edges. Shoreline points and main lake bars adjacent to shoreline structure are key areas right now. Live bait rigging with Leeches has been my personal favorite for the past week, but we have caught several fish on night crawlers and even a few on jig & minnow. I’ve noticed that there are different preferences on different lakes and while the crawlers might be great on one lake, the fish in the next lake down the road may be biting better on the leeches. While I’ve been carrying minnows each day (mainly as a backup), we have yet to see the preference really switch over to minnows on any lake in the area. Northern Pike are responding slightly to the decreasing water temperatures and some decent size fish are beginning to arrive on the weed edges near the shoreline. Casting large rattle baits and spinnerbaits has begun to produce some fish. Not an all out hot bite, but enough action to make it something to think about on your next trip out to the lake. Bluegills are the name of the game in the world of panfish fishing right now. They have been biting aggressively on the deeper portions of the weed flats and out toward the weed points along shore. We’ve located many schools of Bluegills by fishing for the Bass with soft plastic baits and as we locate a school of Bluegills, we’ll take a few minutes to sample some fish by switching over to a small jig tipped with a wax worm, twister tail or half a crawler. If the fish are decent size, we’ll stop and fish them for a while. We've noticed that the smaller and more aggressive fish are quick to move toward the bait and will come quickly toward the surface to bite. We have to avoid temptation to cater to these aggressive biters and get the jig quickly to the bottom where there seems to be a better chance of catching nicer size fish. If necessary, switch to a 1/8 ounce jig with a smaller than average hook and fish it motionless near the bottom. You'll get less fish, better quality. Bass fishing has been amazing! These critters are going very well on almost every lake I’ve tried and we’ve stumbled in to some fantastic action by fishing with jig and soft plastics. While the Bass have been aggressive, they have remained on the deeper weed edges and going deep with a 1/8-ounce jig head and plastic worm, crawdad or lizard has been the clear preference of these fish. We’ve had our best action on steeper drop off areas adjacent to weed flats or steep drop off areas adjacent to Lilly Pads. With all of the sun we’ve had lately, the Bass seem to really like that overhead cover as long as it’s near deeper water. We have not done really well in the heavy pads in shallower water, although there have been some fish in these areas. A Slug-go or similar type jerk worm rigged weedless is the ticket for these shallower fish. Crappies are still hit and miss. We’ve had a few good sessions and a few slow ones. The biting fish we’ve found are located in heavy cover like brush and deeper cabbage weeds. We’ve had to fish vertically with a 1/16-ounce jig head tipped with a small minnow. Let the jig fall into the deep cover and experiment by raising and lowering your rod tip slowly until you find a level that they like. My approach has been to take an hour or so to experiment and if they seem to be cooperative, keep searching. If your favorite spots aren’t producing, move on to something else until evening time when the Crappies move around more freely. I sure wish I had a Musky report for you, but my Musky schedule has fallen apart this summer, Cancellations of several Musky trips have resulted in re-booking the dates to folks that have been more interested in the faster action of Bass, Walleye and Panfish. So I haven’t been hitting the water as hard as normal for the Muskies this month. According to reports from other folks, the Musky fishing has picked up in the past several days and I’ve always been an advocate of fishing hard for Muskies during the Full moon periods of July, August and September. That’s right now and I’m lucky to have a Musky trip coming this weekend. Hopefully, I can give a better report next week. Back into the heat wave! Summer returned this week and with it, water temperatures climbing back into the low to mid eighty-degree range. We found surface temps of 85 on Monday and on several of the area lakes, Algae blooms have been getting much thicker. With water levels down to normal now, these blooms will start to color the lakes and we should be seeing an improvement in shoreline fishing on the lakes that remained unusually clear during the high water period earlier this summer. For me, the past week has been one of catering to family fishing trips where action fishing for Bass, Panfish and anything that bites is the rule of the day. Thankfully, the fish have been cooperative and for the families getting their last vacation before the school year starts up again, the hot, sunny summer weather has played right into their hands. I’ve never seen more folks tubing, swimming and skiing as we have this week. The conditions have been perfect! Crappie action is becoming a part of the daily mix again as these fish locate on the deeper weed edges and out on the deeper main lake drop-offs. 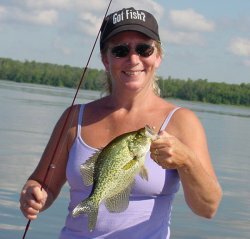 Dream girl, Marcia Newton shows off a nice fish she fooled by fishing vertically with a 1/16 ounce jig head and small minnow. Sunny hot weather forces these fish to hold tight to cover, fish vertical and slow! Crappie fishing has begun to enter into the daily mix again as these fish have started to stage out toward deeper main lake breaklines and the deep outside edges of standing weeds. With the sunny weather, the Crappies have stayed in tight to the cover and to catch them we’ve had to move slowly along the edge and dip a 1/16 ounce jig head tipped with a minnow or 1-1/2 inch tube tail down into the cover. Move too fast and they won’t bite, but give them a little time to spot your jig and they are hitting it hard. It’s slow going until you find them, but once you do, there are flurries where you’ll get ten or more at a time. When the action dies down, start the search again for the next batch. If you happen to know the location of some brush piles or DNR Crappie Cribs, there are fish using these structures as well. Same rule applies, fish slow and vertical giving the jig plenty of time to work toward the bottom. For Crappies that locate in open water near the main drop-off or on the edges of structure, you can move a bit faster. Because these fish are out deeper, it’s better to go with a slightly heavier jig like a 1/8 ounce bug eye and move along the edge at a slow pace looking for an active fish. Once you locate a group of fish, stop the boat and use the vertical approach just like in the heavier cover. Walleye anglers are clearly dived now between those folks fishing the shallow weeds and those fishing the main lake bars and humps. There are good populations of fish both deep and shallow now, both suffering from a case of "over feeding" and both requiring anglers to have excellent timing. About every third day there is a great period of Walleye action and if you are there at that time, the fishing will be awesome. The other two days are anything from grinding out one fish at a time, to periods of action followed by a couple of hours of searching. In my opinion, the best bet right now is larger main lake structures like long bars adjacent to deep water. The fish have a variety of places to locate on these large structures and anglers can move along the edges until groups of fish are located. Live bait rigs with Night Crawlers and Leeches are producing fish on the structures and active fish are riding high on the top edges of the bars. Slowly back trolling along this upper lip has been effective. Weedline fish have been located in pockets where harder bottom mixes with the weeds. It’s possible to fish these weeds with live bait rigs if you replace the standard walking sinker with a bullet type sinker. These move through the weeds a bit easier. The leaders don't need to be really long, 4 to 5 feet will be plenty. I usually tie leaders that are just a bit shorter than the length of the fishing rods that we're using to make storage easier and that's been a good average for me. The hooks should also be a bit smaller too, this helps when you’re trying to wiggle through those standing weeds. If you think there are enough fish in an area, slip bobbers have been producing some fish. The only problem is that if the groups of fish are small, you may spend a lot of time fishing an area after you’ve already caught the few fish that were available. It’s not a bad idea to keep a slip bobber rigged up and ready to experiment as you move along the weed edges. Largemouth Bass are still active and keeping us busy. Most of our fishing for them continues to be using the plastic worms, Crawfish imitators and jigs. Another effect of the hot sun is that we’re seeing more Bass locating on the edge of Lily Pads now. Especially where the Lily pads are adjacent to deeper drop-off areas. The fish seem to be trading back and forth between the shallower (but heavy) overhead cover and the deeper wed edges where the food is much more plentiful. I think they’re feeding on the weed edges and holding in the heavier pads when the sun is bright and high in sky. Family fishing trips are a big part of late summer. With only a few weeks left until school starts, most folks are enjoying their last vacation of the summer. Weather has been perfect for the family trips! 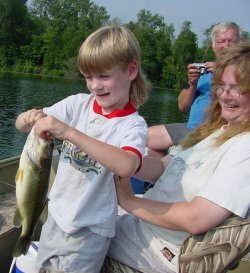 Warm water fish like Bass and Bluegills keep kids plenty busy and there's enough large fish action to keep the adults happy at the same time. Bluegills are incredibly active right now and we’ve been locating huge schools of fish that attack everything we put in front of them. It’s been common to locate them while we’re casting for the Bass. Once we find them, we move the boat in shallower until we’re right in the weeds. We can see schools of 50 to 200 fish swim toward the bait. Once they’re located, use a small jig head tipped with a cut piece of worm. Size of the fish depends on the lake you’re fishing. I think it’s important to take a variety of sizes and don’t be bashful to utilize some of the smaller fish. They are excellent for pickling and many lakes suffer from over population of stunted fish. I know it doesn’t look as good when you come into the fish cleaning shack, but you really are doing the lake a favor by taking some of the smaller fish. Anyone willing to do that should be able to easily get plenty of these scrappy fishes right now. Northern Pike are also tucking in to the heavier cover and we’ve noticed that with the warmer water temps, these fish have become less active. Really warm water temperatures are not ideal for Pike, but for folks who like to cover ground trolling the deeper weed edges, there are some fish to be caught. Deeper running Crank Baits like the Salmo’s fished near the edge of deep weeds will catch you some keeper size fish. We’re also catching some decent size fish while we cast to the deep weeds for Bass, but the pike are deep on those edges in heavy cover. Spinnerbaits and other fast moving surface baits are not really producing just yet. Look for the faster approach to start picking up as fish begin moving back toward the shallows in the next few weeks. Muskies action is heating back up again as it did during the first heat wave. The best action has been on the lakes that have more color from Algae blooms. It’s harder to see your fish, but there easier to catch. The deeper clear water lakes have plenty of follow up action, but most of these fish have been lookers and not takers. Top-water baits fished over heavy cover have been our best bet so far. Fishing Report 7/27/05 Jeff Sundin – Weather Cooler, Action Hotter! A welcome relief for my white Norwegian skin has been this weeks cool front that moved surface water temperatures back down into the mid seventy degree range. The fish seemed to welcome the cooler weather as much as we did because the action has been good for the first part of the week. No real big changes in fishing style or presentation have been required, following the same basic game plan as I described last week has been holding up really well. Mitch Long and Char Benson enjoying a great day of Bass fishing. These are not giants, but the average size has been fantastic with an occasional large fish to make it interesting. 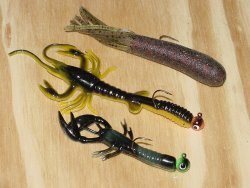 Fishing with soft plastic Crawdad imitators or large tube tails are perfect for tricking hungry Bass that are feeding on hatching Crawfish. Look for areas where weedlines meet with Rock or gravel stretches and fish these baits on the bottom with a twitching or hopping action. Largemouth Bass continue to be the highlight of my fishing. These fish are active and running very nice in average size. Like the Pike, Bass are holding on the deep weedlines making this perfect for folks who want the action bite. With a 1/8-ounce jig, a plastic worm or other soft plastic creature we have the system dialed in for the time being. Hold your boat at the outside edge of deep weeds in 12 to 25 feet of water cast to the deep weed edges and hold on! Find weeds that have rocks mixed in and do even better! Here’s a tip that I stumbled in to this week; there’s a new crop of Crawfish hatching on the gravel and rock areas adjacent to the deeper weeds. We’ve been using a 2-1/2inch crawfish on a 1/8 ounce jig head and both the Bass and the Pike are gobbling them up. Yesterday (Tuesday) we fished almost exclusively with these crawdad imitators. Panfish are set up on these deeper weeds as well and every day we have a little more action from the Sunfish that pick at the tails of these soft plastic baits. When you discover an area that’s holding panfish, you can re-group and switch over to smaller jigs. With warm water, smaller soft plastic baits like a 1-1/2 inch tubes or shad bodies will catch plenty of panfish. The old stand-by, 1/16-ounce feather or marabou jigs are great too. An ultra light rod and light line will make it easier to cast and fish these small jigs so I’d recommend having a special one rigged and ready to go. The water is so warm right now that these fish are active. Bobbers don’t seem to be required and if anything, seem to be slowing down the action. It’s better to make short casts into the weeds, let the bait settle and work it back toward the boat with a swimming/hopping action. Walleyes continue to roam the deeper flats and mid lake structures. Rigging with Leeches seems to have edged out the crawler bite by a slim margin, but depending on the lake, crawlers are still pretty reliable. I’ve been starting out each day with a couple of anglers using each bait and try to narrow it down from there. 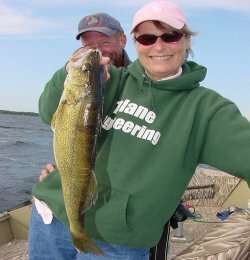 On a couple of lakes that have both Walleye and Smallmouth, we’ve caught both species in the same locations by rigging with larger size minnows. Redtails are working really nicely for this, but Creek Chubs, large Golden Shiners and even mid size Sucker minnows will work as well. If you like the action bite, jigging the deep weed line with smaller minnows is still producing everything from soup to nuts. Don’t be surprised if you catch a 4-inch Perch, 17-inch Bass and a 30-inch Northern Pike all on the same weedline. Walleyes on the weedline come in lots of shapes and sizes. But Bill Spender caught and released one of the better examples of what happens when you get into the mixed bag action bite. Nothing wrong with catching one of these. Northern Pike size has been improving this week, we’ve had several fish over 30 inches and a lot of fish in the 3 to 6 pound range. The fish are not responding very well to casting, but fishing deep with a jig and 4 to 5 inch minnow is turning out some nice fish. I suspect that anglers who like to bobber fish for Pike would have some good action as well because these fish are coming out of the deeper edges of the weedbeds. This is perfect for folks who want to anchor and let a large Sucker minnow do the work. Muskies are slow to move into high gear so far this summer, but certain lakes are producing well right now. It’s going to take a little travelling, but you can find several lakes in Northern Minnesota where the action is heating up. Like the Pike, fish have been slow to move toward the shallows because of clear water, but lakes to the North of Deer River and Northeast of Grand Rapids are showing signs of improvement. We’ll be starting in on the serious search for these fish during the next week and Musky reports will get more detailed next time around. Fishing Report 7/20/05 Jeff Sundin – Mid Summer Patterns, Classic Action! Classic mid summer patterns and summer weather like it used to be! That’s what I’ll remember about 2005. Every day is a new experience, but the pattern is getting to be fairly predictable right now. Several days of building heat that ends with the inevitable cold front and accompanying thunderstorm. Fishing swings from really good to really tough depending on which day of the cycle you’re on at the time. But, for the most part, fishing action is holding up well for folks who are willing to work at it, especially if they’re willing to switch to the active species of the day. Largemouth Bass like this one are showing up in good numbers on the deep weed edges. Find a weedy point with rocks mixed in and your in the chips! Helps keep your mind occupied when your boyfriend is golfing like a million miles away! With water temperatures now holding firmly in the upper seventies, there are stable populations of fish inhabiting the lush weedbeds and the weather changes seem to induce a daily re-structuring of the pecking order in these weed beds. For example; I’ve fished one popular Grand Rapids area lake 3 times during the past two weeks. On the first trip we had cool weather and breezy conditions. The deep wed edges were inhabited by walleye that we caught on jigs with minnows and crawlers. On the second trip we encountered warm, breezy weather and the deep weeds were filled with Northern Pike that we caught with jigs and minnows. On the third trip the weather was drizzly, cold and breezy and the same deep weeds were filled with active Bass that we caught on you guessed it, jigs and minnows. The locations never changed but as the shifts in weather influenced fish locations we were able to get in on some great action as long as we didn’t care which fish we found at these locations. This to me is the classic mid summer pattern and we’ll probably be looking at more of the same for the next month or so. 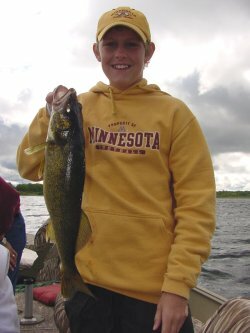 Folks who are sticking with Walleye fishing in Northern Minnesota right now are finding the better schools of fish on mid lake bars and humps. Larger bars where you can set up a good long drift have been the best bet on windy days and smaller humps (reefs) are a better bet on calmer days. There are still several varieties of insects hatching out in the deep water and until these bugs clear up, there will always be some fish out deep. Huge schools of minnows located in the shallower weeds will eventually be a strong attraction for these Walleye, but they’re slow to move in. For the time being folks who like to fish weeds for Walleye ought to stick with the deepest weed beds, especially weeds near deeper main lake drop-offs. Every form of baits and tackle are working to some extent and while we’ve been having our best luck rigging with Crawlers, other anglers are swearing that only leeches are working. 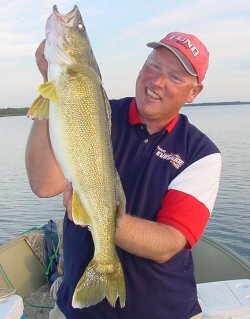 We’ve still caught some nice Walleyes on jig and minnow combos especially on rock reefs and deep weeds. There are also fish being caught by trolling crankbaits as well. So the upshot is fish with your favorite confidence baits and concentrate on location. You’ll catch enough Walleye to keep you happy. 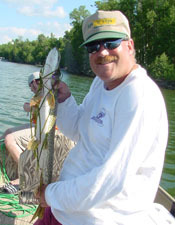 Northern Pike action has been fairly reliable for fish in the medium size range of three to six pounds. 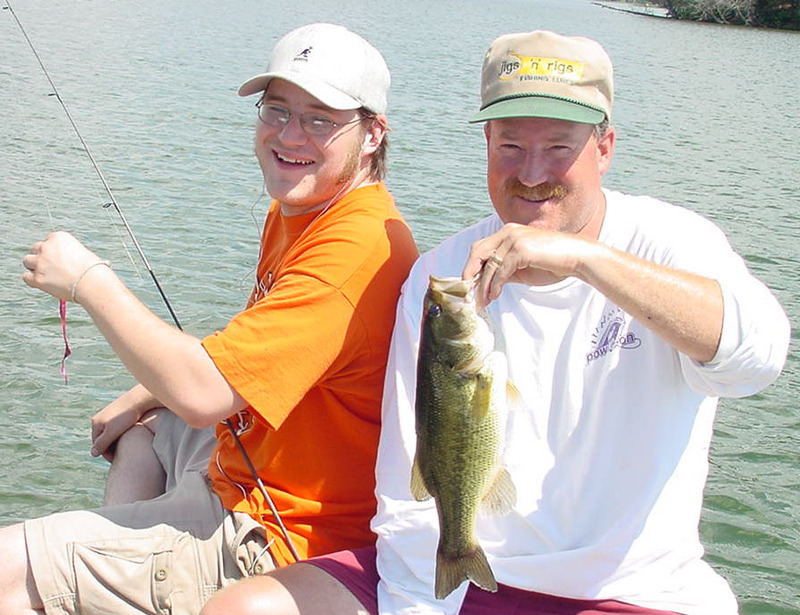 An occasional larger fish is caught, but we still have a way to go before the larger fish get easy to locate. Water color is beginning to improve as the high, clear water from this spring has receded a bit. Algae blooms are more evident each day and this will help in the search for larger pike. For now; spoons, spinnerbaits and jigs with soft plastic tails are working nicely on Pike. Some folks are trolling and doing well, but I prefer jigging the deeper edges and working them a bit more thoroughly. Again, fish how you like to fish and you will have some Pike action. Largemouth Bass are filling my heart with joy these days. This has been the highlight of the past week for me as we’ve located several schools of above average size Bass. Like the Pike, Bass are holding on the deep weedlines making this perfect for folks who want the action bite. With a 1/8-ounce jig, a plastic worm or other soft plastic creature we have the system dialed in for the time being. Hold your boat at the outside edge of deep weeds in 12 to 25 feet of water cast to the deep weed edges and hold on! Find weeds that have rocks mixed in and do even better! Panfish are just getting set up on these deeper weeds as well and every day we have a little more action from the Sunfish that pick at the tails of these soft plastic baits. When you discover an area that’s holding panfish, you can re-group and switch over to smaller jigs. 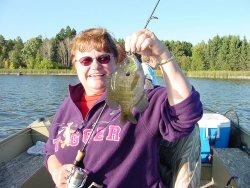 With warm water, smaller soft plastic baits like a 1-1/2 inch tubes or shad bodies will catch plenty of panfish. The old stand-by, 1/16-ounce feather or marabou jigs are great too. An ultra light rod and light line will make it easier to cast and fish these small jigs so I’d recommend having a special one rigged and ready to go. The water is so warm right now that these fish are active. Bobbers don’t seem to be required and if anything, seem to be slowing down the action. It’s better to make short casts into the weeds, let the bait settle and work it back toward the boat with a swimming/hopping action. The weather has been downright hot! Water temperatures are now consistently in the upper seventy to low eighty-degree range and for the first time, we’re starting to see some color from Algae blooms in some of the Itasca area lakes. A sluggish bite that lasted through most of the recent heat wave finally gave way to better action with the arrival of a minor cool front a couple of days ago. In fact it was like a switch turned on just before a series of storms arrived on Monday and fish that had been fairly hard to catch, started feeding aggressively on Monday afternoon. As always, peaks and valleys in the action are part of the territory during mid summer, but the arrival of a North wind and a hint of dryer air really help pick up the pace. One real bright spot is the arrival of fish to the mid summer weedline locations. Anglers who look forward to the weedline "action bite" are getting in on some of the summer’s best variety fishing. 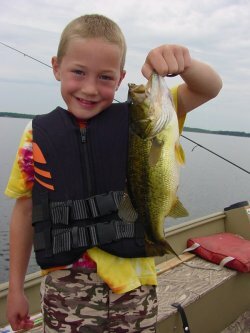 Bass, Pike, Walleye and panfish are all inhabiting the same weedlines on many of our smaller lakes and this is one of my favorite ways to fish during mid summer. Since the area is full of lakes like this, this is the perfect time to do some exploring and you’ll be amazed at how easy it is to find a nice quiet spot where you can work your magic. Not bad, Bass, Pike and Walleye all within a couple hundred feet along the same weed line. Simple, but effective. That’s what working the weedline bite in mid summer is all about. Depending on which fish you really want to target, slight adjustments in bait and/or presentation can put you within casting distance of three, four maybe even more species all at the same time. The fastest and easiest way to locate fish on the deep weed edges is to start by holding the boat just outside the main weedline and cast a 1/8-ounce jig head tipped with a plastic worm toward the weeds. Let the bait fall into the weeds until you make contact and then working mostly vertically, bring the bait back toward the boat using a series of twitches, hops and swimming motions. You can really vary your retrieve to suit the particular type of weeds you encounter along the way. Deep Coontail calls for a faster retrieve because it’s easier to snag, Cabbage weeds allow you to get your bait closer to the bottom and areas where weeds are mixed with rock or gravel provide opportunities for slow trolling through the pockets and edges. The structures worth looking for will generally be large weed flats that have distinct edges at or near the deeper water drop-off. Sometimes, fish will be spread out across the flats instead of just using the deep edge. You can check this fairly quickly by casting a spinnerbait or shallow running crankbait across the flats. This is perfect for kids who need a little pick me up while you’re looking for a good school of fish. Another smart idea is to keep track of the type of cover where you locate fish. If it’s a Cabbage patch where you have your first good action, start zeroing in on more Cabbage. Likewise, if you find fish in Coontail, Bulrushes or other cover try to find more of the same type structure and you will likely see a pattern. Whenever you locate rocks adjacent to these weed beds, pay extra attention. Rocky spots harbor lots of food and provide great cover. Rocks will attract Bass, Pike and Walleyes. Weed beds like this are a perfect hideout for mid summer fish of all kinds. Never pass up a chance to try this variety fishing approach. Time goes by fast when you're having fun! Pay attention to the type of bites you happen to be getting in the area you’re fishing because once you locate fish, you might want to change your presentation to capitalize on a particular opportunity. For example; fish that grab the bait quickly and run sideways are probably Bass and fishing the plastic worm is perfect for them, but when you get bites that feel like a series of hard picking attacks, you’re probably being attacked by panfish. Switching to a small jig with a tiny tube or 2-inch twister tail will help you score on some of the panfish. Walleye will pick the plastic worms up and slowly move off giving you the sensation of pressure on the rod tip. When you get a few bites like this, switch to a live night crawler or minnow on your jig and you’ll increase the odds of getting more Walleye from that weedline. It’s possible to keep catching Walleye on the plastic too, so it pays to try varying the color and type of plastics you’re using to see if there’s one that really stands out on a given day. Once you’ve discovered a couple of good opportunities, the choice to single out a particular target species will be yours. My personal preference is to keep working baits that provide the most action, but it is possible to single out a bait that works best on the fish you really want to catch. The process is mostly trial and error, but you will soon learn a few tricks of your own and be well on your way to finding out why I like this type of fishing so much. 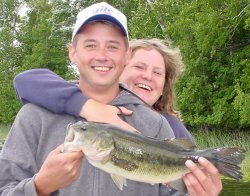 Fishing Report 7/05/05 Jeff Sundin – July Is Family Fishing Time! Thanks everyone for being patient while I took a few days off to be with the family. Now after the birthdays and fireworks are over and I’ve had a little mid season break, we can get back down to fishing with renewed enthusiasm. Needless to say, summer fishing patterns are still with us and for the most part the fish have made most of the biggest moves of the season already. Summer patterns will remain stable for the majority of the warm water season and fish locations should be fairly predictable for another month or maybe even longer. Because of frequent cool periods and high water, most of the Grand Rapids area lakes are amazingly clear for this time of year and even though surface temperatures have warmed up, I’d expect that we’d see scant evidence of any major fish kills this summer. For this reason, folks who want to start searching for those late summer Pike should expect to find them deeper than usual this summer. Walleye anglers have mainly been keying in on the deep-water bite where Walleyes are feeding on insect larvae as it percolates near the bottom edges of main lake structures like bars, humps and expansive mud flats. It’s been hard to see the full effect of the Mayfly hatch this year because frequent high winds have kept the surface clear of the hatching flies. Nevertheless, it has been going on for a couple of weeks already and in some cases, warmer water lakes are almost past the prime time Mayfly hatch. As the fly larvae slowly makes it’s way toward the surface, the attraction loses its luster and locating schools of minnows will again be the key to Walleye location. On these lakes fish are finding their way back toward rock spines and deep weeds located near these large flats. The fish don’t necessarily move very far, just enough to locate a better source of food. 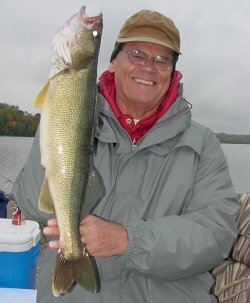 Start by fishing areas where fish had gathered for the "fly-feast" and move toward structures with either rock or weeds until you re-locate the Walleye. Weed growth is coming along nicely now and shallow water Walleyes are inhabiting the deeper portions of these new green weed beds. We noticed that areas where weeds meet deeper water, rocks or gravel are where the better schools of fish are holding. With the clear water, a nice chop on the surface helps break up the outline of the boat and helps get the fish moving. This has been the best bet for fishing the weeds. But when it’s calm, we’ve been able to catch some of these fish by going into the weeds and "flipping" our jigs tipped with either minnows or crawlers, into pockets. These pockets, (open spaces between weed clusters) offer Walleyes an ambush spot to catch bait as it moves through. The secret is to move through the weeds slowly with your trolling motor and making short casts into the weed pockets out ahead of the boat. This flipping technique is no secret to Bass anglers everywhere, but I’d say it’s been under utilized by Walleye Anglers and most fishing guides in Minnesota. It is definitely worth your time to give it a try. 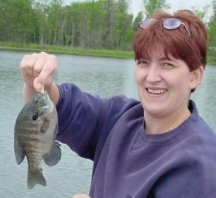 This is the time of year that families can enjoy some great panfish action as Crappies, Bluegills and Perch begin gathering in larger numbers in predictable areas. It’s a great time to capitalize on those evening hours where the fish and mosquitoes all move at the same time. For folks who want to fish during the "bug spray bite", here’s a great tip that really works. Carry a bottle of Avon Skin So Soft (no we aren’t selling it) this has been the number one repellent for me this year. Another item that’s worked very well for the flies that bite on warm sunny days has been Cactus Juice, a product made from Prickly Pear Cactus. Both of these products work and they’re safer than the traditional bug spray. I prefer them because they don’t eat my equipment the way regular bug spray does and I don’t worry about putting it on my dogs. Crappies have already begun showing up in the deeper, open water areas where we expect to see them in mid to late summer. These open water fish are currently holding near, but not necessarily on or in cover. Deep-water rocks, Deep Coontail or Cabbage weeds on the edge of the deeper breaklines are both holding some Crappies right now. You may notice that these fish are finicky during high light times right now. But gray days and low light periods in early morning or evening will encourage aggressive feeding. Bluegills are moving away from shoreline areas where they just finished up spawning and are locating in the mixed coontail, cabbage and Grass lines on the flats adjacent to spawning areas. Like the Walleye, Bluegills will seek areas where insect larvae and small crustaceans inhabit mixed gravel and marl areas. When you locate a spot like this, you will have consistently good fishing for sunfish and Bluegills for at least a couple of weeks. Sometimes Crappies will key in on the same food source and you can have a mixed bag. 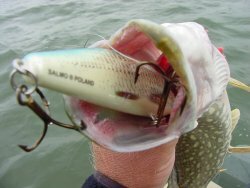 Use the same technique I mentioned for locating weed Walleyes. Use your trolling motor to slowly move through the weed beds and casually flip out a 1/16 ounce jig tipped with a small worm or cut piece of night crawler. Once you find a couple of panfish, hold in that area. Fish vertically very near the bottom and use little or no motion. If there’s a better school of fish in the area, you’ll catch plenty of them by using this simple method. If the school of fish is sparse, keep moving until you locate a larger one. It may take some probing, but you will find them if you keep at it long enough to see it pay off. Bass, both Smallmouth and Largemouth are locating in deeper water as well. Largemouth are showing up on the outer edges of deep weeds and Smallmouth are working the sand breaklines during the early morning, then moving to deeper points and steep breaklines with mixed rock or gravel. The Crawfish are slowly, but surely starting to appear on these areas and the natural attraction to Bass is powerful. This is a great time to fish with a jig and small plastic worm or crawtail. Use a fairly light jig and let the worm flutter in and around the structure. 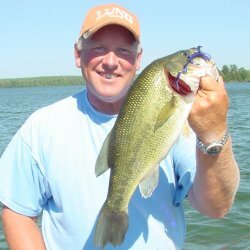 Spinnerbaits fished across the deep weed flats are also producing some nice Bass right now. Larger Northern Pike are showing up on the deeper portions of the new green wed beds, especially on the deeper lakes that have been slower to warm up. Holding toward the deeper edges, they’ve been easier to catch with a jig and minnow. In fact, the largest fish we’ve caught in the past week have all been on a jig/minnow on the deeper weed edges. With all of the sunshine, it’s been tough to get these fish to move up and take spoons or crankbaits, but they would probably cooperate on a gray day with a little rain or chop on the water to make them move. An alternative to the jig/minnow fishing would be to slow troll a large sucker or Chubb along these deeper edges. Main lake structures adjacent to deep water are also holding some of the larger pike and we’re on the verge of the deep water trolling patterns that produce both Pike and Musky in the mid summer.